The sources for this blog come from the following institutions: 1.) 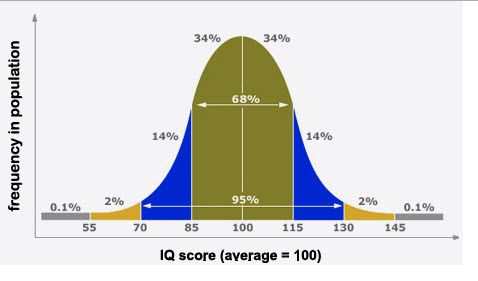 College Board, 2.) National Center for Education Statistics, 3.) US News, 4.) The Cafferty File and 5.) New York Times. My wife and I have two older granddaughters attending Georgia State University in Atlanta. The oldest is pre-law and the second granddaughter is majoring in textiles. Our son, their father, was discussing with me the incredible costs of sending those girls to school, even with scholarships, grants, loans and generous grandparents. “How much more could it cost than when you attended Mercer, I ask?” I was literally blown away. Books alone were about $600.00 for each—one semester; one semester and undergraduate at that. I am one of those guys who always purchased new books. I always said that surviving an engineering course is somewhat like earning a “badge of honor” and in my opinion, keeping your books just may come in handy as reference guides when working a real job. With that being the case, I took a look at several of the books I used as a student years ago. Are you ready for this one? Granted, that was years ago, specifically 1961 through 1966. OK, I’m an old guy but these are undergraduate publications, the content of which has not changed that much over the years. Undergraduate work is ground zero and during that time basic foundations are hopefully established from which more detailed and specialized work is accomplished. The concepts are really not cutting edge at all. The comparative cost of books necessary for completion of undergraduate education got my attention. I decided to take a much closer look at how university costs have risen. I was actually shocked. Here we go. Can you imagine the debt after four years of attending a private university? Granted, a public education is considerably less expensive but still substantial. Very few families can pay outright the costs of a four year degree; wonderful if possible but somewhat rare indeed. An estimate of the actual itemized cost is shown with the next chart. OK, where does the money come from if you are not a trust fund baby? Another look! As you can see, approximately 50% come from Federal loans—indentured slavery. 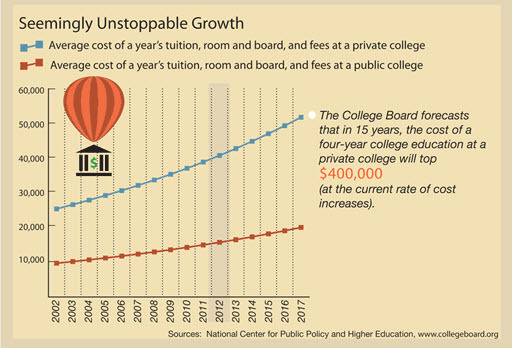 Fewer than 12% of private college students pay those schools’ high sticker prices. Fully 88% of all freshmen at private universities received scholarships to reduce their costs, according to a recent survey by the National Association of College and University Business Officers. Private college students receive, on average, $15,530 in scholarships and federal tax benefits, reducing their average net cost to $26,700, the College Board found. 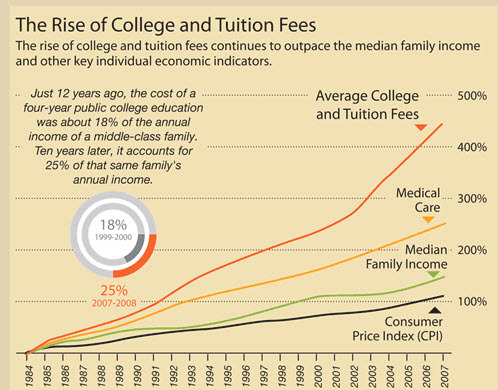 Fewer than half of all public university students pay the full sticker price to attend. Federal surveys show at least 52% of all students at public four-year universities receive scholarships or grants. 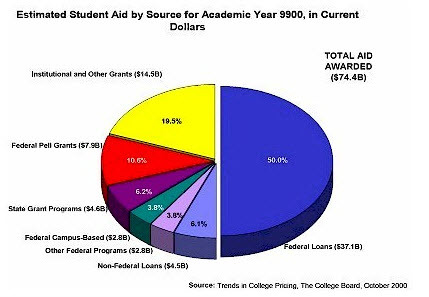 Aid, not counting loans or campus jobs, brought the net tuition paid by the average student at a typical public university to about $2,500, the College Board estimates. That brings the total average net cost of a year on campus (including dorm, books, travel and living expenses) to $11,400. The really sad news– according to one study, the median starting salary for students graduating from four-year colleges in 2009 and 2010 was $27,000 a year. That’s 10% lower than what those who entered the workforce from 2006 through 2008 earned. A separate study found only about 45% of college graduates under age 25 are working jobs that requires a college degree. Less than half. That number varies from major to major: Those who majored in education and teaching or engineering are much more likely to find a job requiring a college degree. But while engineering jobs are highly paid, education and teaching jobs have much lower earning potential. And here’s a sobering thought: Half the 54,000 jobs created in May of 2012 came from McDonald’s. I studied engineering, specifically mechanical engineering, because I was fascinated with the way things worked. How they were put together. What components “made them go” and go properly. How to improve designs that would allow the products to “go the distance” and perform their function well into a tenth year or even longer. In my wildest dreams, I did not realize my efforts would allow me to work to the ripe old age of 70. I unknowingly chose one profession that seems to remain in demand– regardless. Now, I have made every attempt to keep up with existing technology. You really can train old dogs to learn new tricks. If I were giving advice to an entering freshman, I would say consider the engineering profession. Consider a life in the STEM (Science, Technology, Engineering, and Mathematics) professions. These disciplines will not fade as time goes by. They will not lessen in importance. They are global in their appeal. One possible fact does worry me. By virtue of university costs, we may be structuring a caste system n which the educated control the uneducated and using this mechanism, advances become problematic if not impossible. Some educators feel this is happening now with the remarkable elevation in costs…Just a thought.